Laddus are the yummiest sweets, don’t you agree? During one of the navarathri festival days, I felt like making some laddus, but not like the regular ones. I wanted to make something new that was never made before. At that time, the mighty apples taking rest in the fruit basket caught my attention. So I wanted to give a make-over to those with a touch of sweetness. As a result, these laddus came to life! I am glad I thought of it and this recipe occupied my recipe list during parties. Peel, core and grate apples. Keep aside. In a non-stick bowl, add ghee, cardamom seeds and cashews. Stir until the cashews turn golden brown in color. Then add the grated apples and stir well. After some time add coconut and mix well. Finally add condensed milk and mix well. Leave the mixture on a medium flame until it thickens. Keep stirring frequently. When the apple mixture thickens, transfer the contents into a plate and leave until it cools enough to touch. Then take a small portion of the apple mixture and shape it into a ball. Repeat the same process with rest of the mixture. If the apple mixture is still warm to handle, in a plate take some cold milk, dip your hand in it and make the balls so that your hand won’t burn. Roll these laddus in shredded coconut to give them good looks and make them more delicious. Leave the laddus on the plate for some time and later store them in an airtight container. But I have to tell you one thing here: these laddus are not hard like other laddus. These are little soft in texture, but I must say they tasted heavenly. These laddus can be stored in a refrigerator (up to 10 days) to give a long life. “Yummy Festival Feast – Diwali” hosted by Pallavi. “JFI – Festival Sweets” hosted by Srivalli. JFI is the brainchild of Indira of Mahanandi. Also sending this to "Original Recipes" event hosted by Lore. Oh yes ladoos are one of my favourite indian sweets. I have never had aple laddo though. Hats off to u to think out-of-box. These cuties look yummy.. 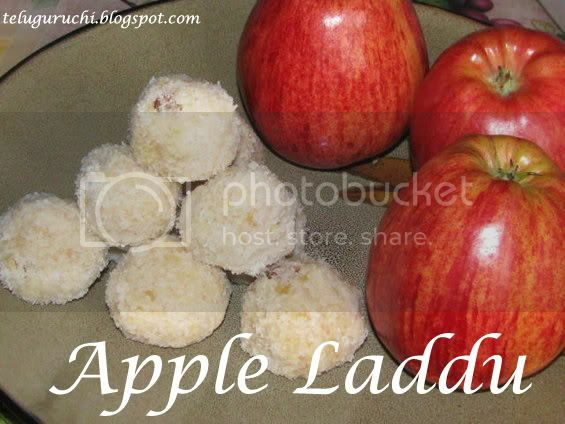 Very creative recipe Uma :) From where do u get such creative ideas...Looks mouthwatering very much..
Uma..wat a lovely idea of preparing laddu from apples...looks yummy..
uma honey this recipe is the best apple recipe I've ever seen in net! thanks a lot for sharing it! have a really fantastic day dear! What a lovely, innovative idea. So innovative sweet Uma...So lovely. Uma, you are so innovative. I would've never thought of incorporating apples into laddus.. they look moist & delicious. 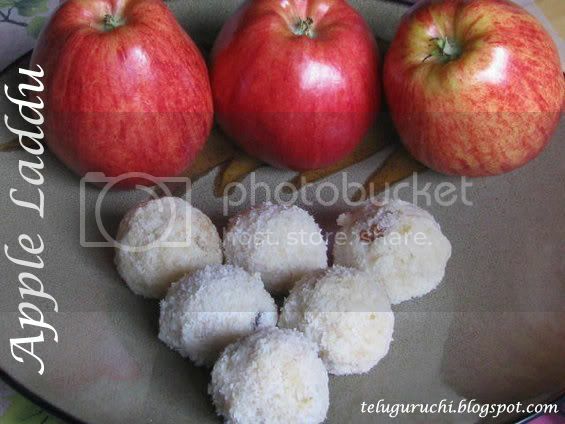 Apple laddu sounds cool Uma..And the tomato bhath looks wonderful tooo..
For sure its very few for me...looks yummy...using apple is lovely idea dear...Gud entry for the events..
New and wonderful recipe Uma! Wow! I have not heard of apple laddus before. This is really good. If this is your own recipe, then you can try sending it to the Original recipe event by Lore. WOW Uma these apple laddus look really good! such a unique recipe uma.. love it.. i have bookmarked it. This seems very out-of-the-fruit-box! Very innovative! very creative uma...and yummy looking ladus..
That does sound delicious! A nice new way to use apples! Uma dear, u always churn out interesting recipes.This sounds great. very healthy dish and creative one. Jee, you do have such innovative ideas girl! Keep them coming! this is totally new to me. 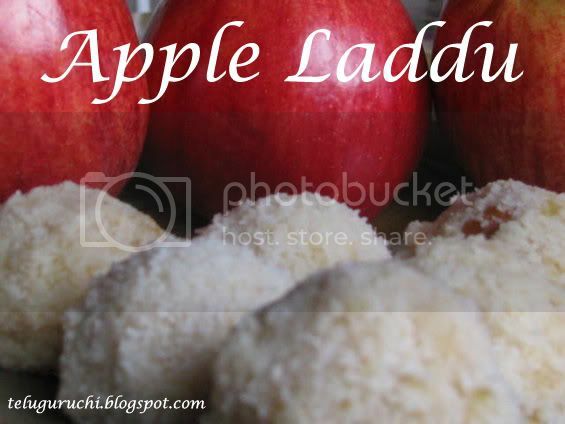 apple laddus. woowowo. perfect for the festive season. yes there are 2 kids. i have only one. second one is son's friend. that place is godavari dist, which u saw in my native place photos. interesting recipe Uma :) I am looking forward to make something different for diwali this time.. and laddus are my favorites as well.. this is a good one.. will give this a try :) Thanks for sharing! Uma, here is the link to the Original recipe event by Lore. wow...how did u even think of this recipe...great,looks very tasty!! very innovative!!! laddus r so tempting! great idea! I'm sure the laddus very tasty because they look so mouthwatering! I'm glad Anudivya let you know about the event and you're now sharing your delicious concoction with the Original Recipes Round-Up. This is looks amazing... and, really innovative. I could never imagine that you could make laddus out of apples!! hi,v.creative recipie....had som queries..Can i use plain milk and sugar instead of condensed milk...?...and how do i follow the procedure then..?...pls lemme kno....as i wnt to make these for Diwali.thanks alot in advance. Thanks for the sweet comments! Sorry I saw your comment just now. Reg. 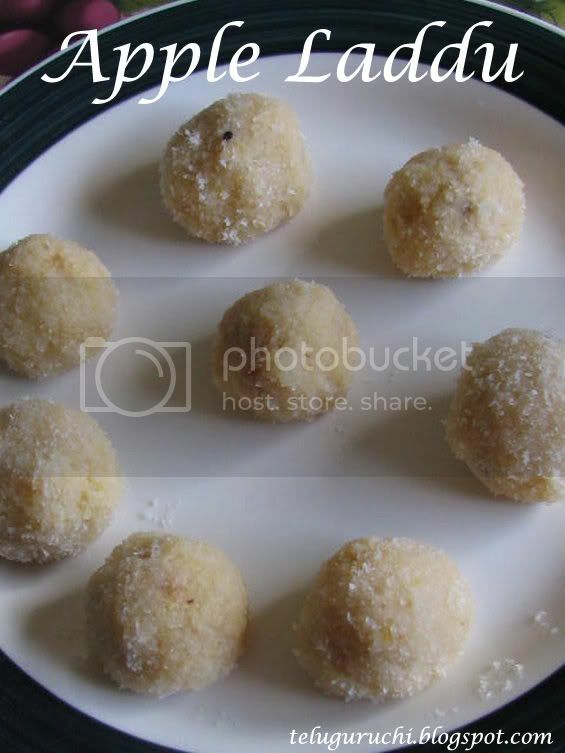 your query: This is my first time experimenting this laddu. So I have to experiment again adding milk and sugar. You can use those, just do like this: Initially, add 1/2 cup of milk and 1 cup of sugar along with grated apples (3 big apples) and follow rest of the procedure. Add more sugar and milk if needed. Hope this helps. Please let me know if you have any doubts! 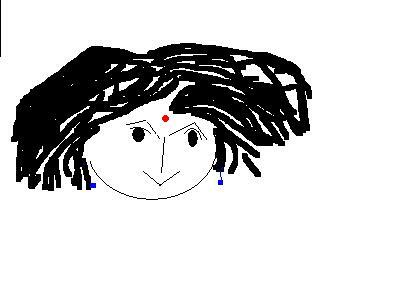 And please let me know if the laddus came out good. Thanks Meenal! So glad that you liked these. This gives me inspiration to do more. Thanks again dear! Gorgeous idea...I was looking for some nice recipe for diwali and found this recipe. I'll give this a try sometime soon. and follow me if you like it. I'm definitely gonna follow u! Very innovative recipe. I tried these today and they were soo yummy.